Friction is the second place winner of the 2016 Schoenfeld International String Competition Chamber Division in Harbin, China. They recently gave their Carnegie Hall debut as part of the Kronos Quartet Workshop. They also opened for Kronos Quartet at Z Space as part of Kronos’s “Under 30″ series. Last summer, they were Quartet in Residence at the New Music for Strings Festival in Aarhus, Denmark. Friction will return to the Shouse Institute at the Great Lakes Chamber Music Festival this June. Since forming in 2011, Friction has given 70 world premiere performances and commissioned 32 works for string quartet. Friction received a Chamber Music America grant to commission a piano quintet from Andy Akiho which they debuted in November 2016 with Jenny Q Chai. They have also been awarded grants from San Francisco Friends of Chamber Music and Zellerbach Family Foundation. John Adams shared Friction’s video of the second movement of his First Quartet on his homepage and called it “spectacular.” In 2015 the video was named the #2 video of the year by its producer, Second Inversion. The video for Andy Akiho’s In/ Exchange, featuring Friction and Akiho, was also chosen by Second Inversion as the #5 video in their Top 5 videos of 2016. Friction’s recording of David Conte’s String Quartet no. 2 is now available on Albany Records. Pinna Records’ Symmetry Series #1 vinyl includes Friction and Mobius Trio performing the first and the last by Danny Clay. Friction has appeared on NPR, KALW, KING-FM, and KUT. Friction is currently artist in residence at Napa Valley Performing Arts Center and Old First Concerts. They were Ensemble In Residence at the Center for New Music and San Francisco Friends of Chamber Music in 2016. In 2014, Friction was selected as one of eleven artists featured in the SF Bay Guardian’s On the Rise issue. While Friction has garnered international attention as commissioners and interpreters of new music, they are also devoted to performing masterworks of the string quartet repertoire at the highest level. 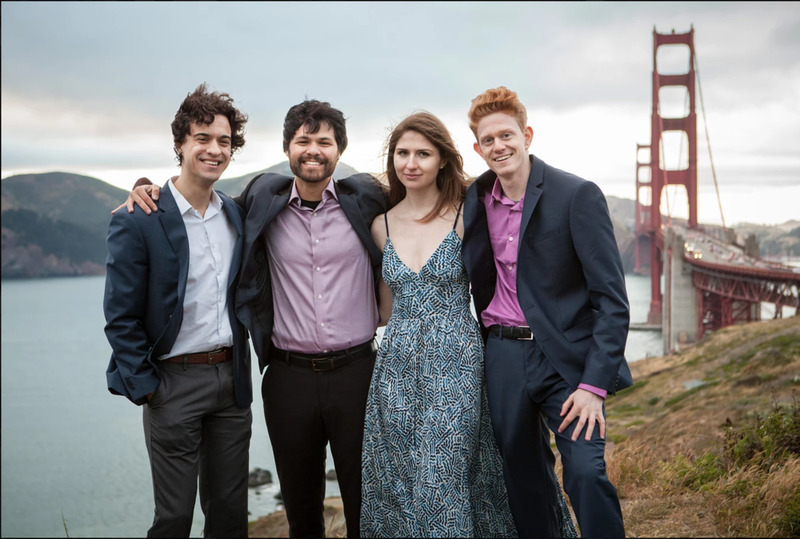 In addition to their Second Prize win at Schoenfeld Competition, they were quarter finalists in the 2015 Fischoff Competition and placed second at the 2015 Frances Walton Competition. They received the 2012 Berkeley Piano Club Award. Friction has participated in the St. Lawrence String Quartet Seminar, the Banff Chamber Music Residency, and the Deer Valley Music Festival. Friction Quartet loves to collaborate with artists of all disciplines. Their premiere of Garrett-Moulton’s “A Show of Hands,” described by the SF Chronicle as “the greatest dance bargain offered in this town since the San Francisco Ballet performed in Stern Grove,” took place in October 2013. The piece features Dan Becker’s original score for string quartet, commissioned by New Music USA, and six dancers that interact with the string quartet by gesturing, lifting, and lowering the musicians. Friction Quartet is dedicated to building new audiences for contemporary music. In collaboration with Meridian Hill Pictures, they appeared in a short documentary, titled Friction, that profiles their educational outreach in Washington DC’s Mundo Verde Public Charter School. In collaboration with composer Danny Clay, Friction realized a graphic score that Danny created using drawings made by his third grade class after listening to Beethoven’s Grosse Fugue. Friction regularly works with an after-school program called “Little Opera” that guides elementary school students through the process of creating an opera. They also workshop graphic scores that the students create and present excerpts of old and new string quartets. Friction Quartet takes risks to enlarge the audience’s understanding of what a string quartet can be, through arrangements of pop music, the use of digital sound processing, percussion, amplification, movement, and by combining music with other media such as dance and film. But they never lose sight of the quartet’s essence—the endlessly nuanced interaction of four analog voices, even when those voices are used to channel real and produce faux digital sounds.